in the upper right corner of the map. This button has the title: "OSM Buildings. 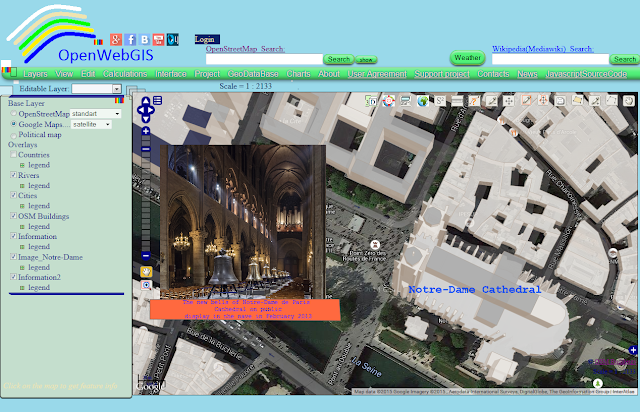 Click for visualizing OpenStreetMaps building geometry …". After that in the list of layers on the left of the map there will be the new “OSM Buildings” layer. See the Figure 1 to get more information. In this figure 1 you see the centre of Paris. 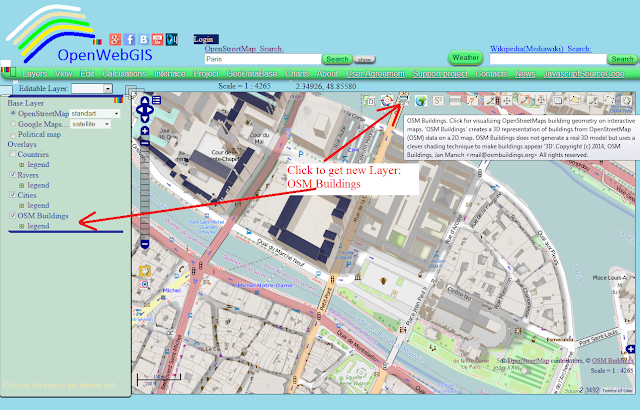 After adding “OSM Buildings” layer you can hover over any building which you are interested in, click and get comprehensive information about it (See Figure 2). When using “OSM Buildings”, you should consider that this library for creating buildings geometry uses OpenStreetMap Tags such as "height" and "levels". But only 1.54% of the buildings in OSM have a height specified. 3.11% has a known number of levels. 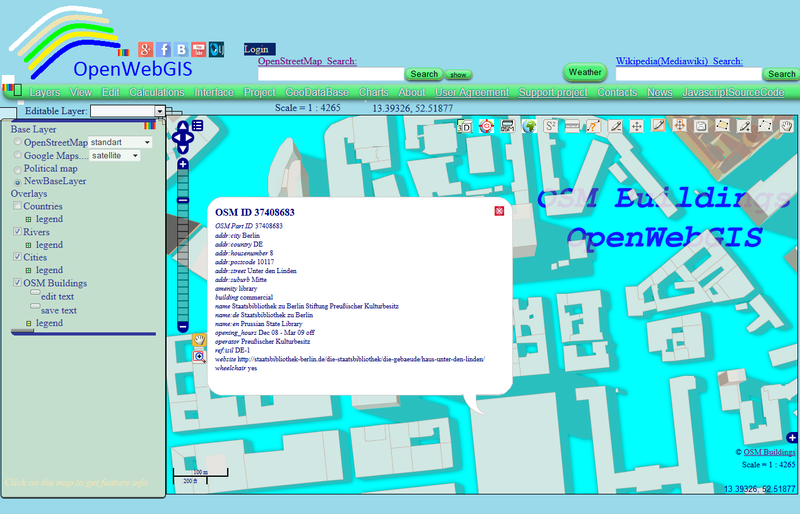 This information is taken from here http://taginfo.openstreetmap.org/keys/?key=building#combinations. That is why you will not be able to see “OSM Buildings” everywhere in the map. As a rule it is functioning in the centers of large cities. 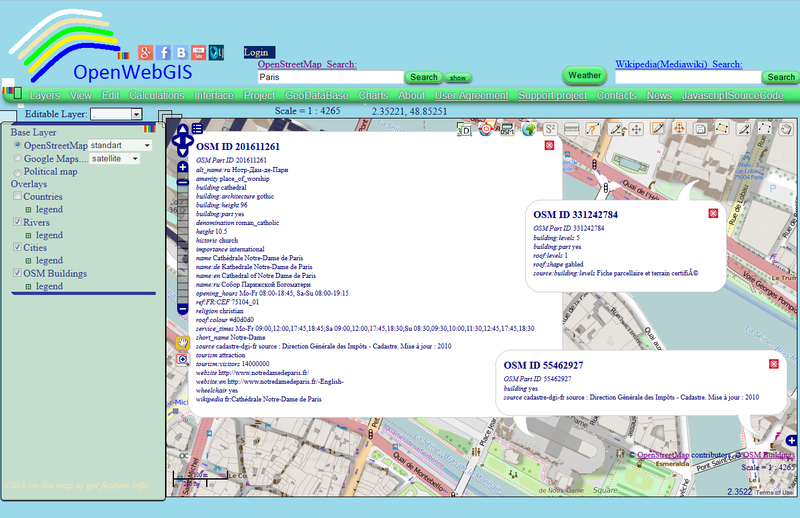 Why may it be convenient to use the possibility of "OSM Buildings" in OpenWebGIS? Perhaps because in OpenWebGIS you can not only look at beautiful 3D models of buildings (See Figure 3) but also to impose on them the layers with pictures, captions, display the results of your calculations, interpolation, etc. (See Figure 4). 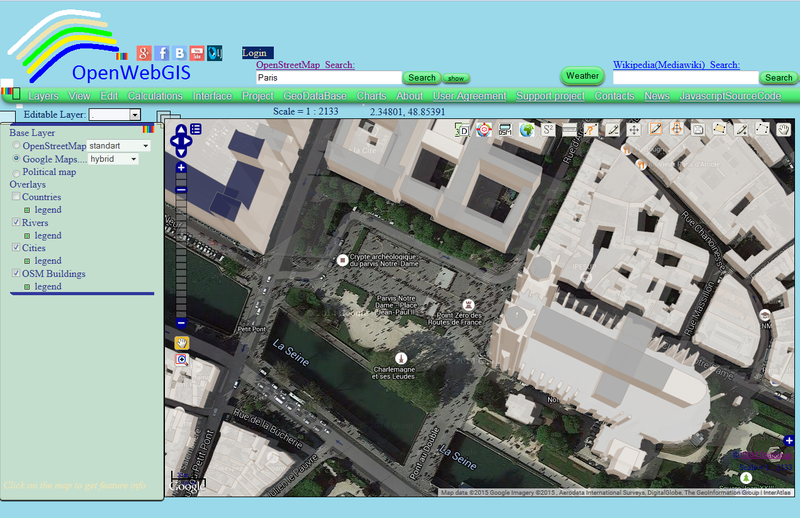 In OpenWebGIS you can use your own base layers and above them you can draw OSM “3D” buildings as it is shown in Figure 5. Please see the result on this map. In this Figure 5 and map you see the centre of Berlin. or read in more details: http://openwebgis.livejournal.com/9902.html. As a result your interface and map will look like it is shown in Figure 6 and on the map by this link. 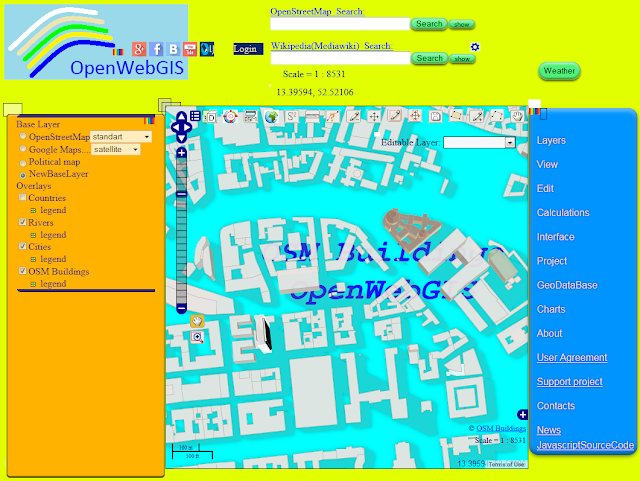 In the nearest future in OpenWebGIS there will be some other useful “OSM Buildings” functions. Developer of OpenWebGIS, Fedor Kolomeyko. Learning new technolgoy would help oneself at hard part of their career. And staying updated is the only way to survive in current position. Your content tells the same. Thanks for sharing this information in here. Keep blogging like this.